Time permitting, I like to do a lot of cooking from scratch because the freshness of homemade items is unbeatable. Look up the basics category to see the posts about making yogurt, ghee, paneer, etc. This event is all about the things that you make from scratch and other tips and tricks you like to share. Is there something specific you do to preserve coriander leaves? Do you store the spices in a particular way? Do you freeze meals to make life easier on busy days/nights? The list goes on and on and if you would like to share them you can either write up a blog post and link it up to this event or you can just send me the tip with your details and I will add it to this post. I am inviting all bloggers and non-bloggers to submit their basics, tips & tricks for this event. This event has no end date and the rules are as follows. 1. Send in any “back to basic” recipe and also tips and tricks that are kitchen/food related. 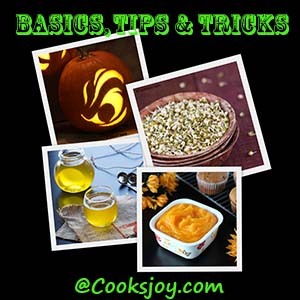 Examples of basic recipes include making yogurt, ghee, pumpkin puree, sprouts, carving a pumpkin, etc. Tips & tricks include kitchen or food related tips. 2. You can either write up your tips in a post and link it up or you can email me the same and I will add it to this post. 3. Only vegetarian or vegan recipes please. Eggs are allowed in baking only. 4. Usage of the logo is appreciated as it helps spread the word. 5. Recipes must be linked to this event announcement page. If sending an old entry, it needs to be re-published with the links. 6. Non bloggers can also send in their basics, tips & tricks to the email below. Please link your entries using the linky tool attached to this post. If you have trouble linking, do let me know and I will add it for you. You can also email me a tip or trick and I will add it to this post. Hey, I can no longer add links. So emailing you the links. Do inform if this linking no longer valid and I can stop linking entries. Nice idea and happy hosting. The red cross means you can delete your own links. Thx. Interesting and love that no date limit,will link mine Vardhini..